Theatre Gigante is excited to announce the return of Frank Pahl’s Little Bang Theory, the dazzling and sublime musical performance group from Ann Arbor/Detroit that delighted Gigante audiences in 2015, playing on toys and children’s instruments, accompanying silent animated films from the early 20th century. 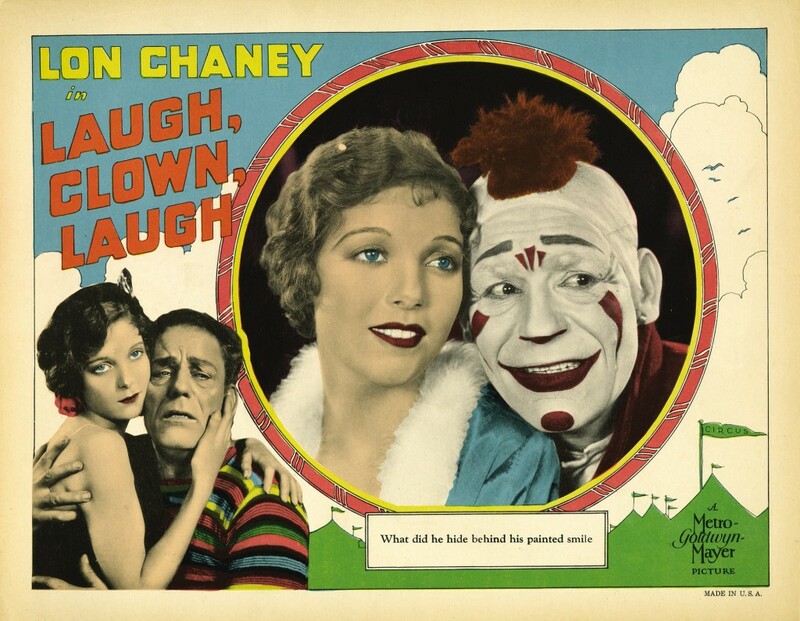 This time around, the band accompanies a screening of Lon Chaney’s 1928 romantic tragedy and silent film, Laugh, Clown, Laugh – the story of Tito, a travelling circus clown touring the country, who chances upon an abandoned child. Naming her Simonetta, Tito decides to raise the young girl as his own – but after she’s grown up, Tito’s feelings towards Simonetta turn from nurturing to romantic, as emotion becomes a tangled love triangle, revolving around Tito, Simonetta and Luigi, a wealthy man whose loving advances Simonetta rejected years earlier. Don’t miss the drama, the passion, and the musical toys played by bandleader/composer Frank Pahl and musicians Terri Sarris and Doug Shimmin. HERE’S WHAT YOUR SUPPORT OF GIGANTE CREATED IN 2016! 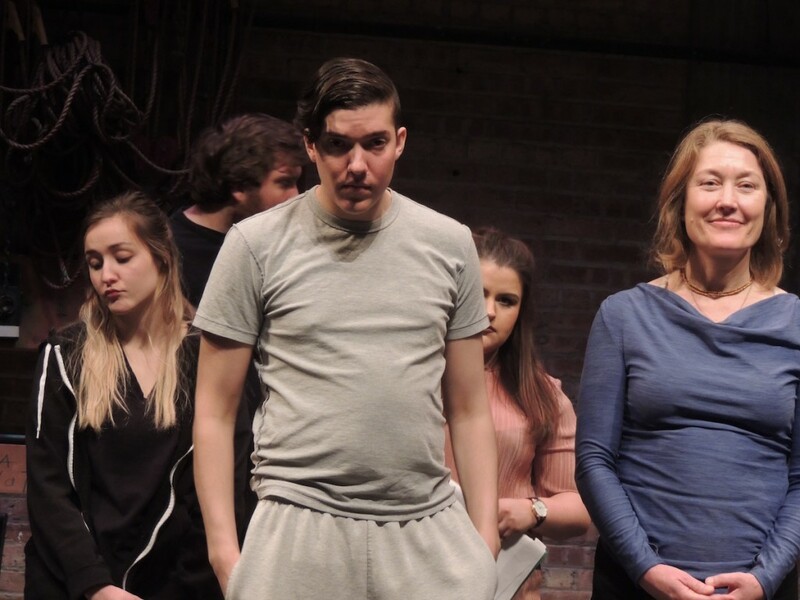 Our first event took place March 4-12, when Gigante presented Georg Büchner’s classic expressionist play WOYZECK at Kenilworth 508 Theater. 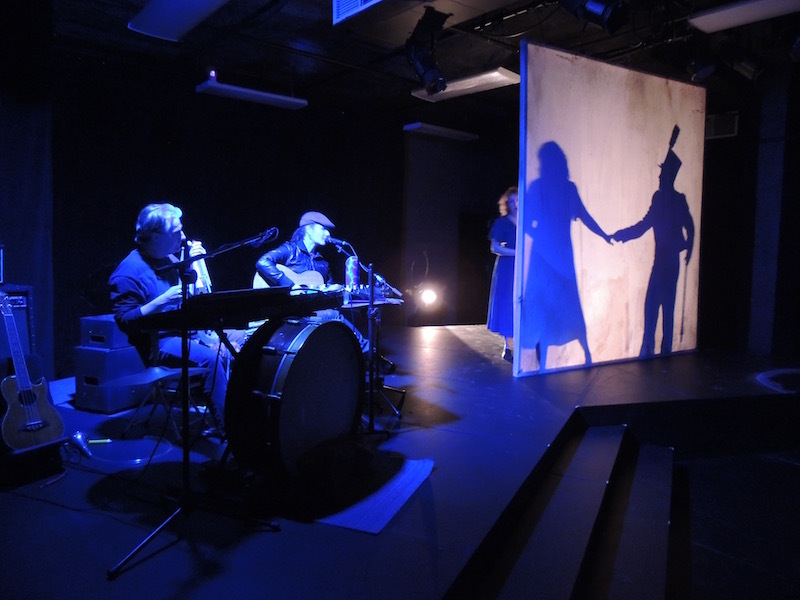 Adapted by Jim Butchart, this original and innovative Gigante interpretation was infused with music composed by Tom Waits & Kathleen Brennan and was exquisitely performed here by internationally acclaimed artists Frank Pahl and Paris-based chanteuse Christine Zufferey. Mark, in the title role, was joined onstage by Isabelle, Leslie Fitzwater, Edwin Olvera, and Michael Stebbins. 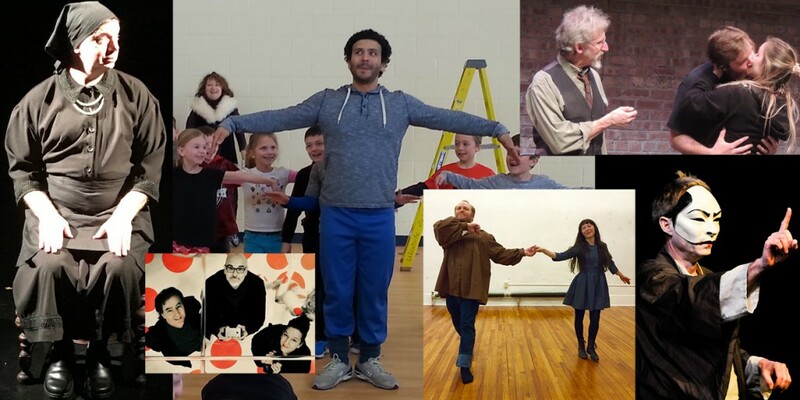 April 4-8 Theatre Gigante performed its PETER & THE WOLF & THE ONE-MAN BAND, created by Isabelle, with Aaron Gardner as the “one-man band,” in nine schools. A resounding success, this Gigante original is presented through the Milwaukee Symphony ACE Program, and reaches approximately 550 first-graders, yearly. -I loved the story and how enthusiastic the artists were. I really liked how they presented the story and the characters. -The performers had a lot of energy. The students were engaged. -A very clever and creative presentation. The students loved it! -I liked how it promoted the students imagination as the characters were performing. -It demonstrated a lot of movement and dancing which is very engaging for the students. Gigante brought Milwaukee another classic performance June 17 & 18, GUY KLUCEVSEK IN CONCERT, at Kenilworth 508 Theater. One of the world’s most versatile and highly respected accordionists, Guy appeared with Gigante for the sixth time. The evening was made up of Guy’s beautiful and hypnotic music spanning four decades of creative work, performed by Guy and Milwaukee’s own treasure, violinist Eric Segnitz. 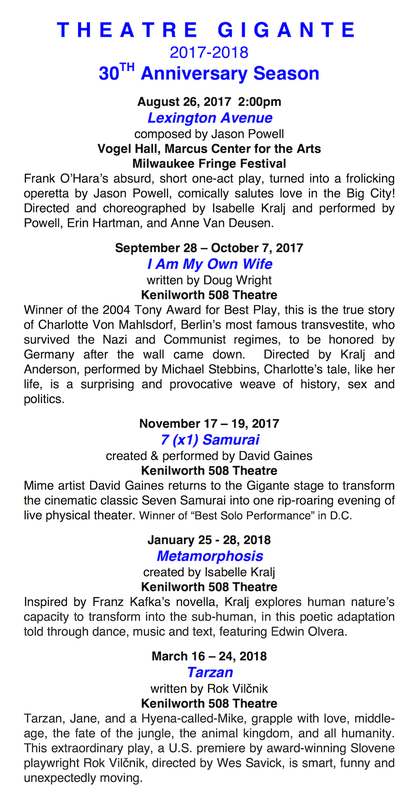 August 28, Gigante premiered Then and Now and Then, written and performed by Mark as part of Milwaukee’s brand new Fringe Festival in Marcus Center’s Todd Wehr Theater. Gigante was thrilled to be a part of the Fringe and hopes this festival will become a Milwaukee theater staple! -Mark, thank you for your personal performance tonight. It was the highlight of the festival for me! -It struck a lot of chords in my own life. Which, in the end, is what it’s all about, really, isn’t it? Shared experience, identifying with one another, finding commonality in the human experience? A political comedy, QUORUM, written by Mark, hit Milwaukee for a little pre-election fun, October 7-15. This very timely piece, actually written 24 years ago, was performed by Mark, Isabelle, and Milwaukee’s very talented Leslie Fitzwater, Ron Scot Fry, Michael Stebbins, Bo Johnson, and Jocelyn Ridgely. Presented at Plymouth Church on Milwaukee’s east side, a perfect setting for QUORUM. 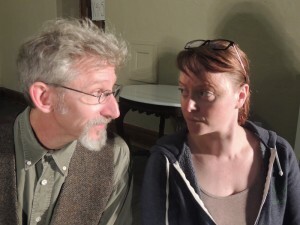 A fun time was had by all, with this one, both in rehearsal and in performance, where we were joined by full houses of lively, charged audiences! We need to show up so there’ll be a quorum and we can continue; the fact that the characters in “Quorum” actually do so is testament aplenty to our commitment and ability, against all odds, to somehow carry on together. 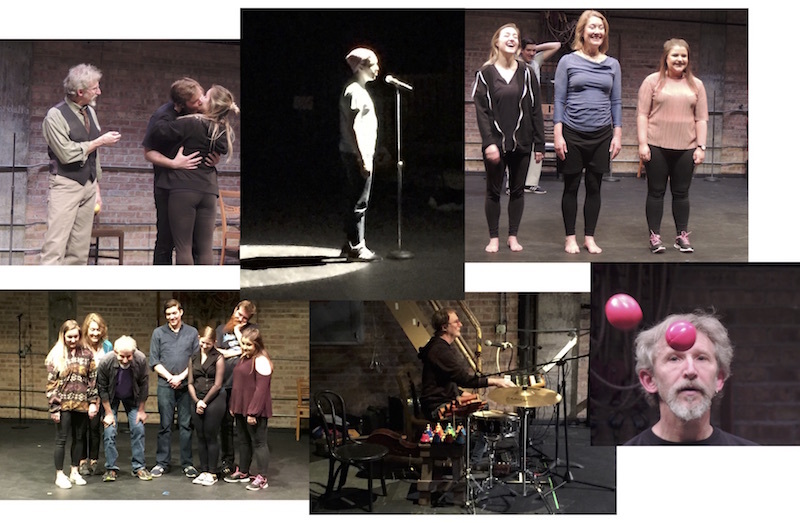 On November 12, Marquette University hosted the Milwaukee Theater Summit, organized by John Schneider, one of the founding members of the new Fringe Festival. The panel consisted of Panna Adorjani (theater scholar, Hungary, EU), and Philip Arnoult (Center for International Theater Development); Gigante Artistic Directors Isabelle & Mark; Simone Ferro (UWM Dance Department); Suzan Fete (Renaissance Theaterworks); Malkia Stampley (Bronzeville Arts Ensemble). Well attended, the event concluded with dynamic audience discussion. November 17 also brought about a Gigante appearance at the Whitefish Bay Library, as part of the Whitefish Bay Talks series. The extremely well attended event’s topic was – our favorite topic – Theatre Gigante! After a brief talk Isabelle and Mark were joined by two Gigante regulars, Michael Stebbins and John Kishline, in a performance of excerpts from SPALDING GRAY: STORIES LEFT TO TELL. The audience was high-spirited and enthusiastic, and we all walked away from the evening feeling stimulated! November/December are the months Isabelle joins four Milwaukee Symphony Orchestra musicians in a school performance highlighting the fundamentals in music and dance. Ten area schools are visited. This program, developed for third grade, ends in a lively hand dance the children perform with Isabelle and the musicians, to demonstrate a creative tool that is sometimes used when choreographing. The program is part of ACE. On the 9th of December Gigante returned to Boswell Book Company for a reading of David Sedaris’ THE SANTALAND DIARIES. The evening was a free event, open to the public. For theatergoers and bookstore lovers alike, looking for fun fare this holiday season, this was just the ticket! Gigante performer Michael Stebbins, no stranger to the work of David Sedaris, read this gem of a story – a humorous account of Sedaris’ stint working at Macy’s Department Store as Crumpet the Elf in Santaland. A good crowd joined us for this classic, at the intersection of Christmas and retail…enjoying a Gigante performance and picking up some holiday presents from Boswell Book Company…all in one swoop! We thank you for everything – your friendship, your attendance at our events, for reading this long newsletter, and for supporting us!